Weekend outdoor shooting on Saturdays and Sundays commences 30th March until the end of September for target shooting and Club events. There are two available start times on days when it is not a Club event or League shoot: 10:15am with sighters at 11:00am for those who want to shoot longer rounds, and, only by prior arrangement, 1:15pm with sighters at 2:00pm for those who cannot shoot in the mornings. No other start times will be allowed, and those setting up for the later session must not disturb those already shooting. Weekday evening shooting on Wednesdays and Thursdays commences 1st May until the end of August for practice and bow tuning when the field will be open from 6:30pm until dusk. Do not arrive before 6pm during school term as children may be present. Visitors are always welcome, but must have current AGB/GNAS membership. Non-members will be expected to pay a 'green fee' of �for weekends and �for weekday evening practice sessions. All outdoor shooting for Club members and Associate members is FREE! Whilst every effort will be made for the field to be open at the published times, there may be occasions when no key holders turn up. A list of key holders is shown on the Contacts page, and their phone numbers are listed in the container. No archer is allowed to shoot alone. There must be at least two archers present at all times and juniors must be supervised by an adult archer. Please note - due to our AGB/GNAS insurance conditions, split-field shooting is not permitted and all archers must shoot to the Field Captain's whistle. Archers wanting to shoot 100 yards must do so from the six left hand spots as only these have the necessary unhindered overshoot distance. A lookout must be posted on the high ground behind the left hand spots while others look for missed arrows as the extremity of the overshoot area cannot be seen from the shooting line. Club or AGB/GNAS dress code applies to all Club competitions and League shoots, smart casual may be worn at other times. Please note - ALL archers are expected to help in setting out and putting away the equipment. Archers arriving after the stated assembly time will not be allowed to shoot. Please see notice board to confirm details and reserve a place. Note - times quoted are the latest for arriving at venue, allowing 45 mins to set up before sighters, or a little longer for certain Club tournaments. 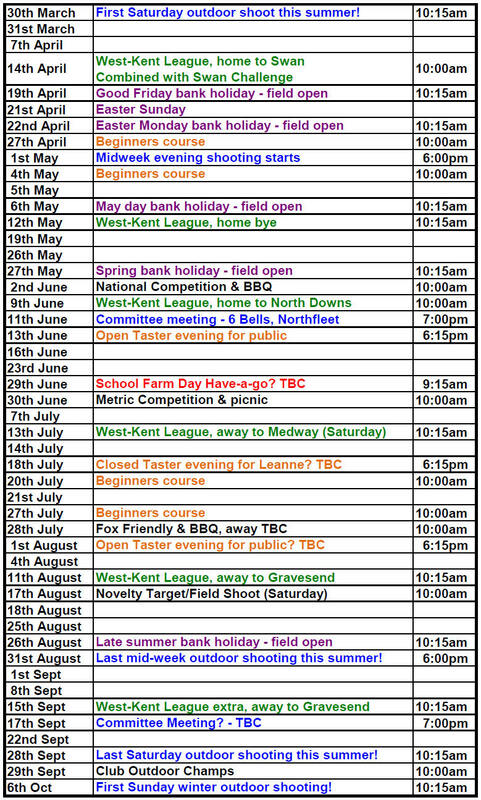 Note - see notice board to register for Club competitions and West-Kent League matches. There may be some weekends when we cannot shoot due to school events. Please check the notice board regularly for any changes. Invicta Coaching Group AGM 27th September?